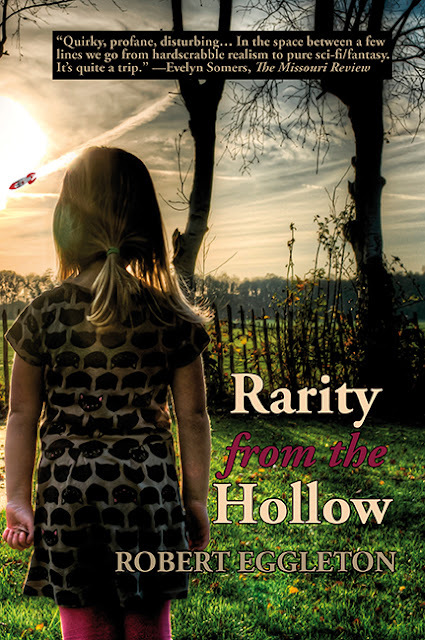 Today, I have the pleasure of introducing Robert Eggleton, author of Rarity from the Hollow, which was our featured Book of the Day last week. Please be sure to stick around after the interview, as there will be an excerpt from the novel. Robert: Hi, Tricia! Thanks for inviting me to tell your readers a little about myself and my debut novel, Rarity from the Hollow. Tricia: Thank you so much for stopping by! Can you tell us a little about yourself? Robert: I’m a retired children’s psychotherapist with over forty years working in the field of children’s advocacy. I grew up as the oldest child of an impoverished family in West Virginia, became active in human rights movements of the ‘60s and ‘70s as a teen, and went to college as an alternative to being drafted and sent either to prison or to the Vietnam War. I remained active in the anti-war movement during college, graduating with a Master’s Degree in 1977. My father was a disabled Vet suffering from shell shock and anger outbursts that he self-medicated with alcohol. My mother was a downtrodden survivor of domestic violence who kept our family together any way that was necessary. My family would fit within an Appalachian subculture that emphasized hard work and fundamental Christianity. I was the third member of my extended family to graduate from high school and the first to graduate from college. My grandparents farmed, were poor but highly respected within their communities – always with a helping hand out to anybody less fortunate. Love abounded and still does despite profound generational differences in social and political values. T: When did you begin writing? Robert: Perhaps to disassociate from a harsh reality filled with alcoholism, domestic violence, and not enough food on the table, I began writing short stories as a child. At the time, paper bags were used by grocery stores. I would tear them open and flatten them out to use for writing stories that I would share with anybody – store clerks, peers, gas station attendants…. During the tumultuous times of the civil rights movement, I switched to writing poetry, and was especially inspired by Lawrence Ferlinghetti, as well as early rock music, such as by Pink Floyd. During college, a few of my poems were published in alternative zines and one was accepted by the 1971 West Virginia Student Anthology. I also wrote dozens of handouts for antiwar protests. During college, between working to pay for tuition and books and studying, I started a few short stories and drafted poetry, but never seemed to find time to finish anything. After college, I concentrated on writing nonfiction. It was a very exciting time for children’s rights. It was the beginning of an era during which children were no longer regarded as chattel. Instead of being locked up with no due process as I had been as a little boy, courts were recognizing that parents could not just dump their kids into jails and big institutions for punishment, or because the parents just didn’t want them any more. I wrote socials service and treatment models, policy, staff training materials, drafted legislation consistent with social services thinking, published research on the correlates of child abuse and delinquency…. Dozens of my investigative reports about systemic deficiencies and how children were treated in jails and institutions were published by the West Virginia Supreme Court where I worked until the end of 1997. Many of these reports are now archived by the West Virginia Division of Culture and History. In 2002, I accepted a job as a therapist at our local mental health center. It was the first job that I’d performed since college that did not involve a great deal of producing written materials. Something started churning inside of me, subsequently identified as a personal need to write. I returned to writing fiction and poetry in 2006. Rarity from the Hollow is my debut novel. T: Can you tell us about your most recent release? Robert: Rarity from the Hollow is literary fiction with a social science fiction backdrop, filled with tragedy, comedy, and satire. The final edition was released to Amazon on December 5, 2016, after circulating as an Advance Review Copy (ARC) for an extended period of time. This novel was the first, if not the only, science fiction adventure to predict the rise of Donald Trump into political power. While there is no political advocacy in the story favoring one side or any other, the story covers many issues being faced today – the refugee crisis, illegal immigration, sexual harassment…. In a nutshell, an empowered victim of child maltreatment, a most unlikely savior of the universe, heads a team of zany characters on a wild adventure. The early tragedy in the story feeds and amplifies subsequent comedy and satire. It is not for the prudish, faint-of-heart, or easily offended. T: How did you get the idea for the book? Robert: I’ve mentioned going to work for our local mental health center and how my psychological need to write started churning deep inside me. Part of my job was to facilitate group therapy sessions for children with mental health concerns, most having experienced maltreatment, some of them having experienced sexual abuse. One day, sitting around the table used for written therapeutic exercises, a skinny little girl with long stringy hair began to disclose. Instead of just speaking about the horrors of her abuse, she also spoke of her hopes and dreams for the future – finding a loving family who would protect her. My protagonist was born that day – an empowered victim who takes on the evils of the universe: Lacy Dawn. T: Of all your characters, which one is your favorite? Why? Robert: I have a love – hate relationship with each character in Rarity from the Hollow. They all have character flaws and wonderful attributes, including the abusive father and Lacy Dawn. Personally, I most like Brownie, the family mutt who plays a very important role in saving the universe. He was the only character on Lacy Dawn’s team to have empathy for what was then presumed to be a vile invading enemy. His empathy skills opened the door for conflict resolution. He was a positive role model for all. Plus, while every character prompted a laugh every now and then, Brownie was outrageous when his internal dialogue was shared with readers. T: What was the most challenging aspect of writing your book? Robert: Writing itself comes easy for me. The hard part is the self-promotion that follows. The most difficult aspect of writing the story was cutting out great scenes that didn’t advance the plot. I wanted to make them somehow fit since some of these scenes were powerful. It took a while, but I cut, cut, and cut some more. Again, however, nothing to do with writing is nearly as hard as the hard work that follows after a manuscript has gone past final editing. T: What is your primary goal as an author? T: What projects are you currently working on? Robert: I’m very much looking forward to taking down the shingle that reads, “Marketing.” Self-promotion with no budget to do so has kept me very busy. Thanks to the kindness of book bloggers like you, Tricia, I have persisted to give Rarity from the Hollow the best shot possible in this highly competitive marketplace. I have short stories in the works, and will be pressed to make the next deadline for a magazine that I have a strong interest in submitting. The next Lacy Dawn Adventure is Ivy, an almost forgotten town and the headquarters for an invasion of Earth by addiction to drugs – another satire. This novel has been almost ready for editing for quite some time but self-promotion of Rarity from the Hollow has gotten in the way. T: What advice would you offer to new or aspiring authors? Robert: I don’t feel competent to give advice to aspiring authors, but I will share a little common sense based on my observations of this marketplace. Don’t expect to be discovered overnight like you were Elvis singing on the front stoop of an apartment located in a low-income neighborhood. Before you publish, make sure that your work as been professionally edited, or as close to it as your finances will allow – not by a friend or anybody with whom you have a personal relationship. If published, to the extent possible, prevent generic one line reviews from being posted on Amazon – they always look like they were written by your friends and detract from other reviews that appear more legitimate. Commit to the long haul by keeping in mind that the majority of those entering the world of books stay there briefly and then drop out never to be heard of again. And, last, never buy a book review and don’t invest more than you can afford in anything. I’ve heard of aspiring authors placing themselves and their families at financial risk by becoming overcommitted to a book that they had written. Hard work pays off, but working smart has better outcomes. Today, he is a retired children's psychotherapist from the mental health center in Charleston, West Virginia, where he specialized in helping victims cope with and overcome physical and sexual abuse, and other mental health concerns. Rarity from the Hollow is his debut novel. Its release followed publication of three short Lacy Dawn Adventures in magazines: Wingspan Quarterly, Beyond Centauri, and Atomjack Science Fiction. The Advance Review Copy of Rarity from the Hollow received considerable praise through Robert learning about the world of books as a novice. The final edition was released to Amazon on December 5, 2016. Author proceeds have been donated to a child abuse prevention program operated by Children’s Home Society of West Virginia. Robert worked for this agency in the early ‘80s and stands by its good works. He continues to write fiction with new adventures based on a protagonist that is a composite character of children that he met when delivering group psychotherapy services. The overall theme of his stories remains victimization to empowerment. Scene Prologue: At this point in the story, Lacy Dawn, the protagonist, is twelve years old. An android named DotCom (his name is a recurring pun throughout the novel) installed a port in her upper spine and has directly downloaded data into her brain for the last several years. His ship is hidden in a cave in the Woods behind the family’s house in the hollow. DotCom was sent to Earth to train and recruit Lacy Dawn to save the universe from an imminent threat, but was recalled due to slow performance. In this scene, DotCom has returned to Earth and Jenny, the mother, meets him for the first time. …..…Jenny (the mother) walked up the hill to Roundabend. She called Lacy Dawn's name every few yards. Her muddy tennis shoes slipped and slid. I hear her voice. Why won't she answer me? Nobody responded. The trees weren't supposed to since Jenny was no longer a child. Her former best friends had made no long-term commitment beyond childhood victimization. They had not agreed to help her deal with domestic violence in adulthood. She hugged the closest tree. There ain't no cave Roundabend, but there it is. She walked toward the entrance. The voices grew louder and she looked inside. Lacy Dawn sat on a bright orange recliner. Tears streamed down her face. Jenny ran to her daughter through a cave that didn't exit and into a blue light that did. “Mom!” Lacy Dawn yelled. “You didn’t say, ‘It’s me’ like you're supposed to (a traditional announcement mentioned earlier in the story)." Lacy Dawn with her body and glared at him. "Grrrrr," emanated from Jenny. It was a sound similar to the one that Brownie (Lacy Dawn's dog) made the entire time the food stamp woman was at their house. It was a sound that filled the atmosphere with hate. No one moved. The spaceship’s door slid shut. He ain't got no private parts, not even a little bump. I will need much more training if I'm ever assigned to a more formal setting than a cave, such as to the United Nations. "He's a doctor?" Jenny asked. Mommy's right. Maybe I need a different argument. It's unusual for a man to promise to come back home and ever be seen again. Brownie likes him and that's a good sign. Maybe she's right about him helping Dwayne. Something sure did and it wasn’t me. It is a nice living room. They've been together for a while and I ain't seen a mark on her. That's unusual too. He ain't got no private parts and that's another good thing. Hell, if I get in the middle, she’d just run off with him anyway. I'd better play it smart. I don't want to lose my baby. “My name was given to me by my manager a very long time ago. It represents a respected tradition -- the persistent marketing of that which is not necessarily the most needed. I spam…,” DotCom said. "Dwayne is sure to be home. I don’t want him to worry. Let’s go,” Jenny said. Jenny were right behind her. Lacy Dawn and Jenny held hands and walked down the path toward home. The trees didn’t smile -- at least not so Jenny would notice. On the other hand, no living thing obstructed, intruded, or interfered with the rite.